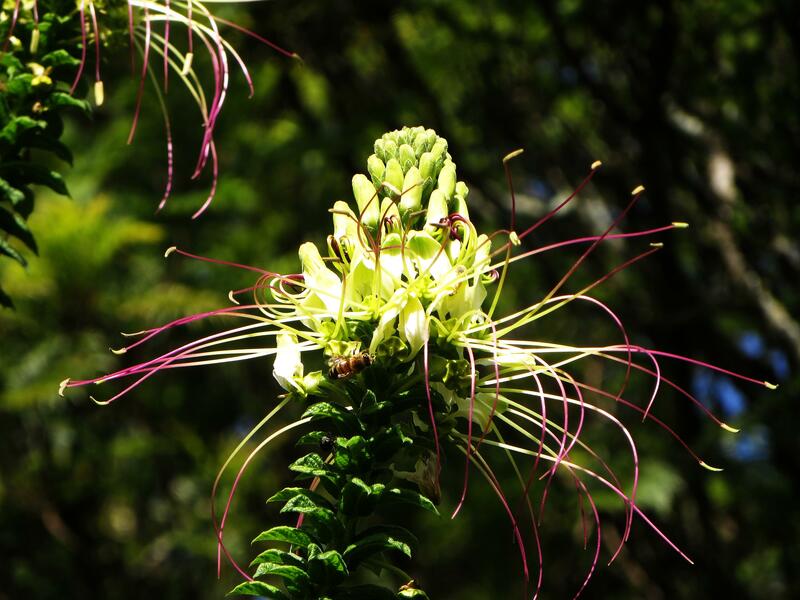 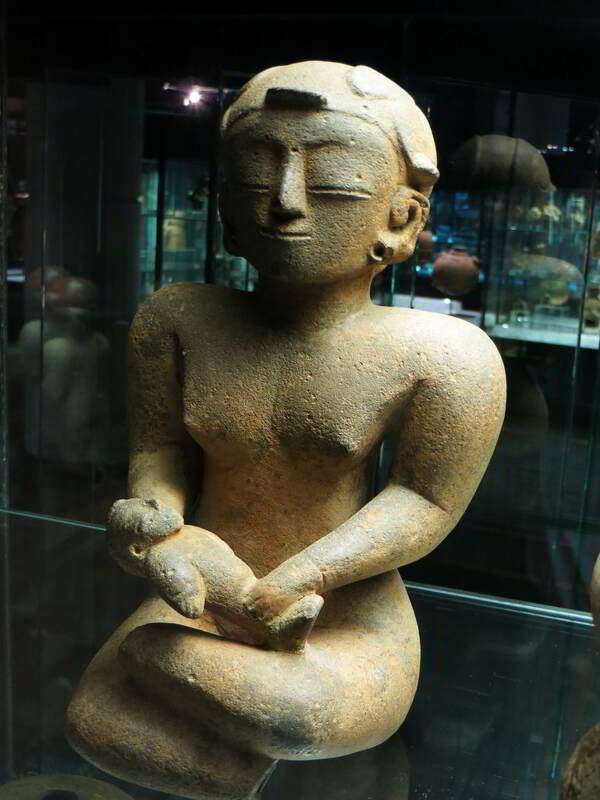 In order to appreciate and get some understanding of Ecuador as a country, it is paramount that you visit at least some of the Museums of Ecuador. 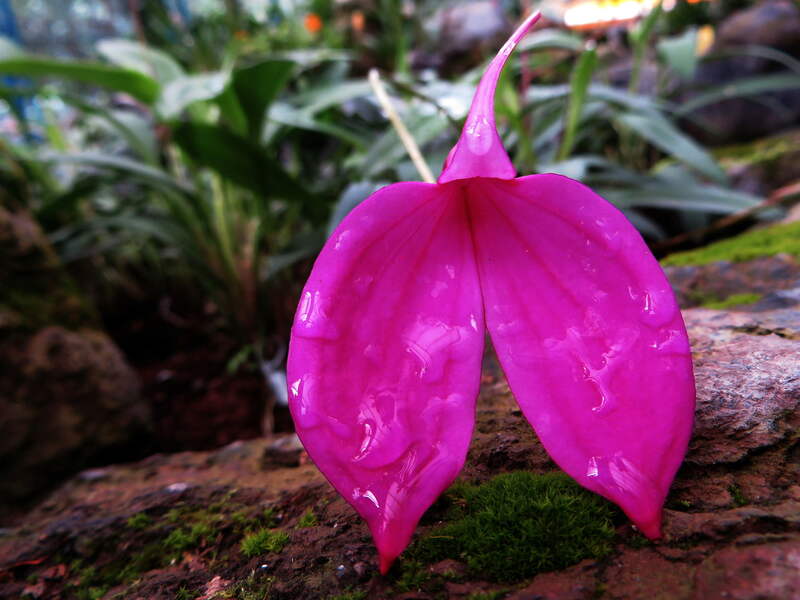 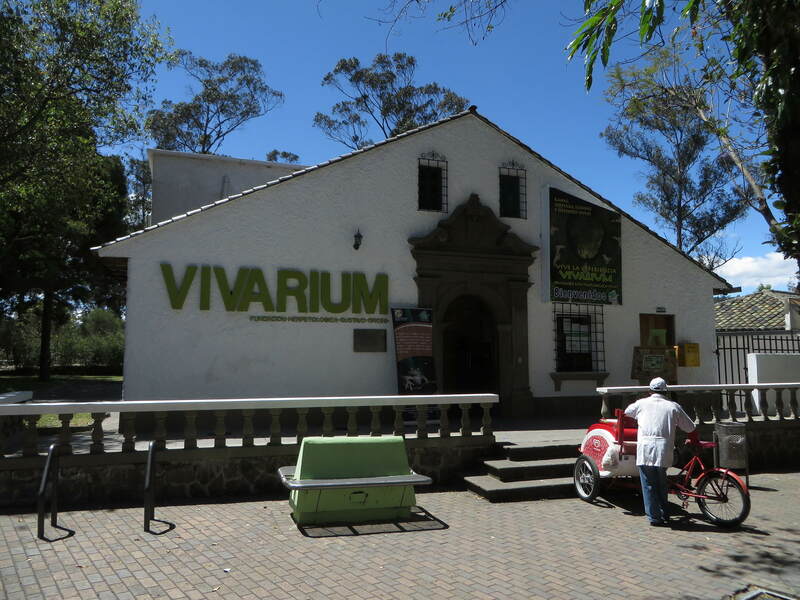 The quality of the museums of Ecuador vary from top notch museums that are at par with the best in the world - although always smaller - to some of the sweetest well meant attempts in rural Ecuador to educate the local population, like the church museum in Baños. 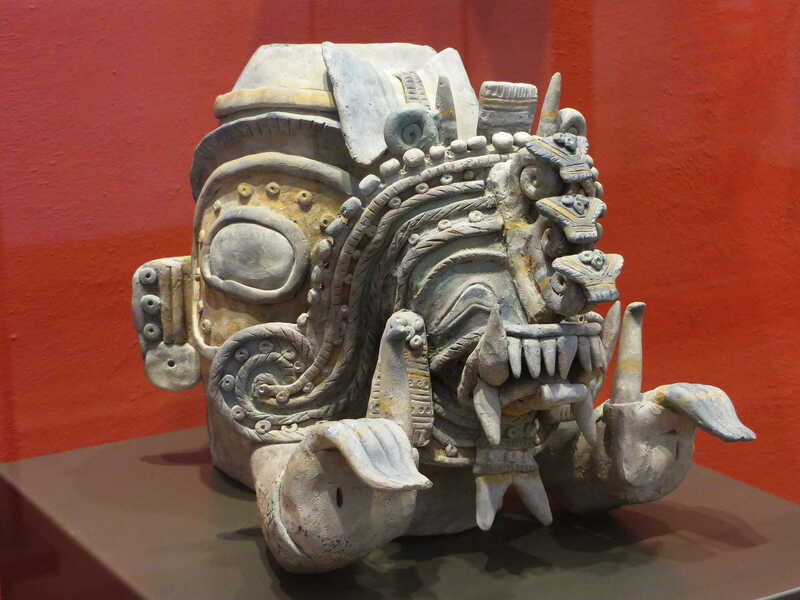 Many of the finest museums are all within 5 minutes' walks from each other and the Plaza Central. 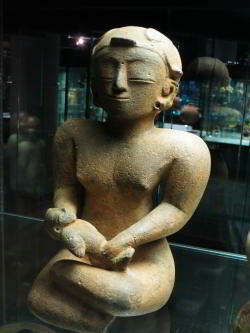 Some merit at least an hour, while others are fun for brief 10 - 15 minutes walk-ins. 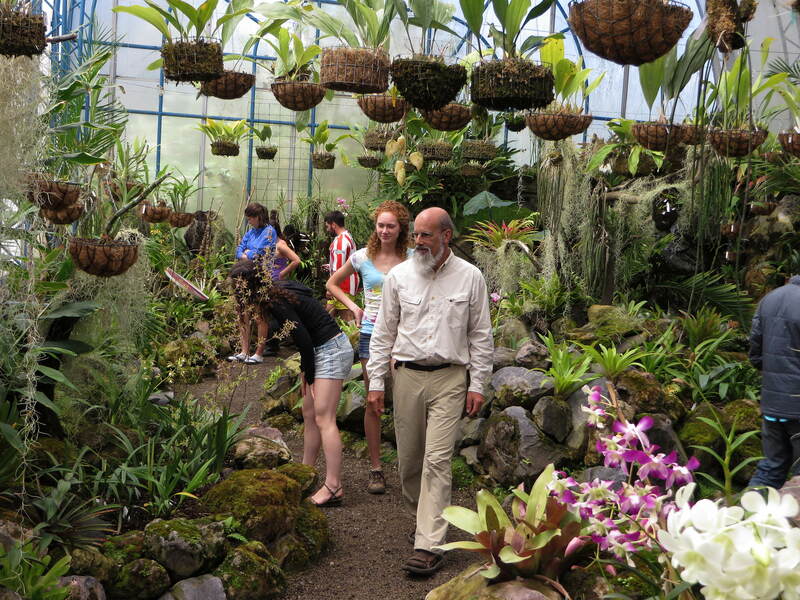 Entry fees are very moderate, usually between $2 and $3 for adults. 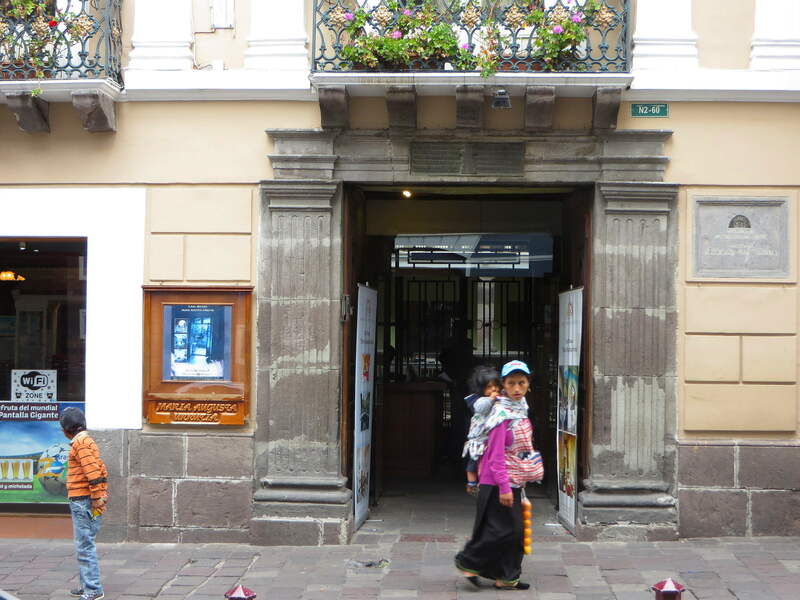 In old town Quito, several museums are hidden behind inconspicuous entrances. The regulations of Quito being a cultural World Heritage Site prohibit the placing of conspicuous boards and redesign of facades. So don't be mislead by a modest entrance, some of the museums behind a simple door are world class! 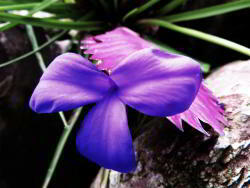 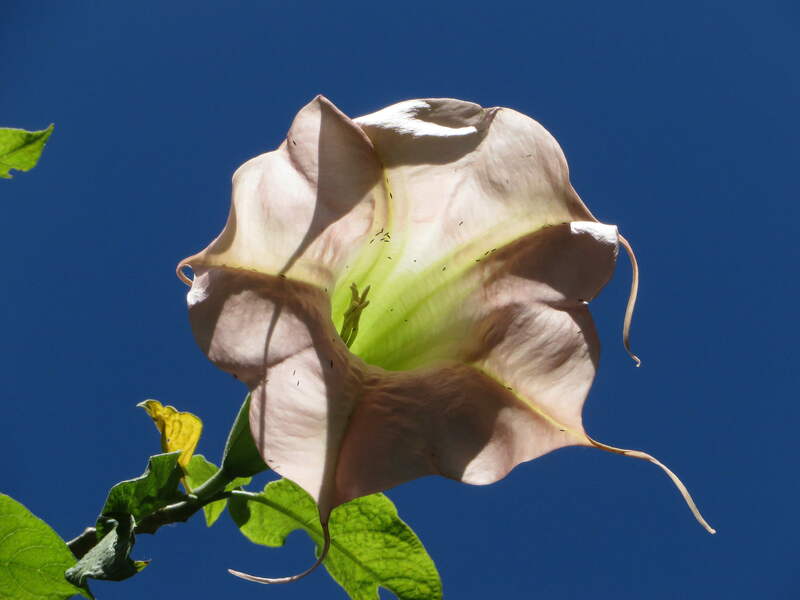 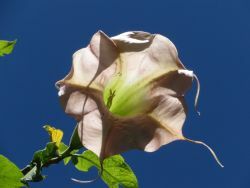 Keep an open eye and appreciate what you are getting. Some museums are nothing more - and nothing less - than a mansion or historical house in Old Town Quito, but to appreciate the lives of the colonial upper class, those places give you a true impression of the history of the country. 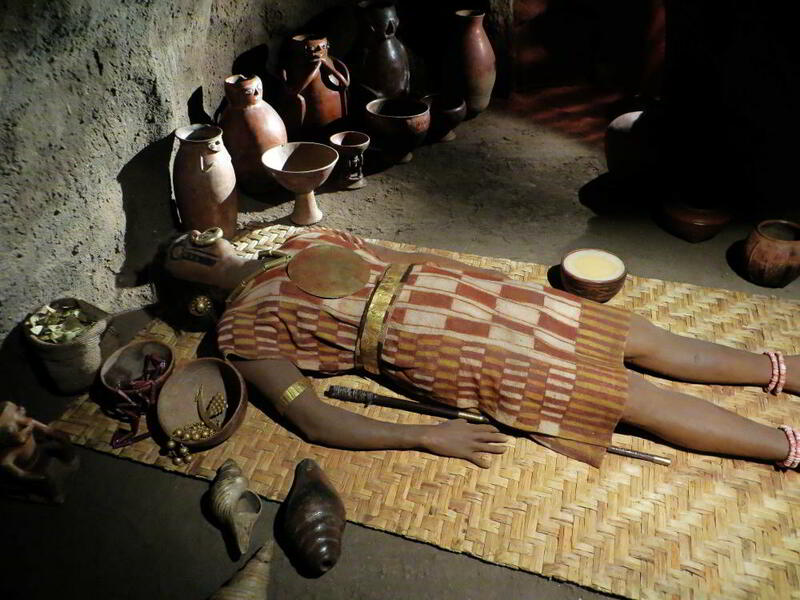 No sophisticated mega museum can give you an impression of what life was like when Ecuador was developing into a nation, as those lovely - but small - museums are offering. 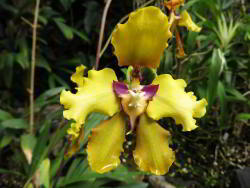 Don't ignore them, pay them a brief visit and let your mind descend into a past of when Ecuador was gradually entering into the adulthood of nations. 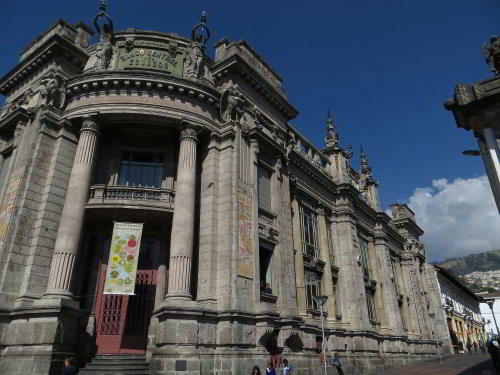 Cultural center of France with expositions of French art as well as cultural events. 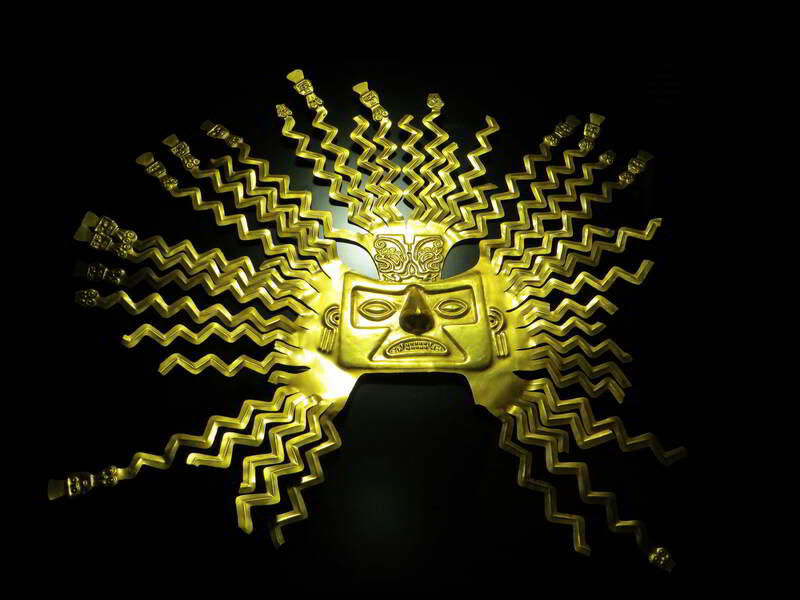 Cultural center of contemporary art. Cultural center of the Goethe Institute to promote cultural exchange with art gallery. 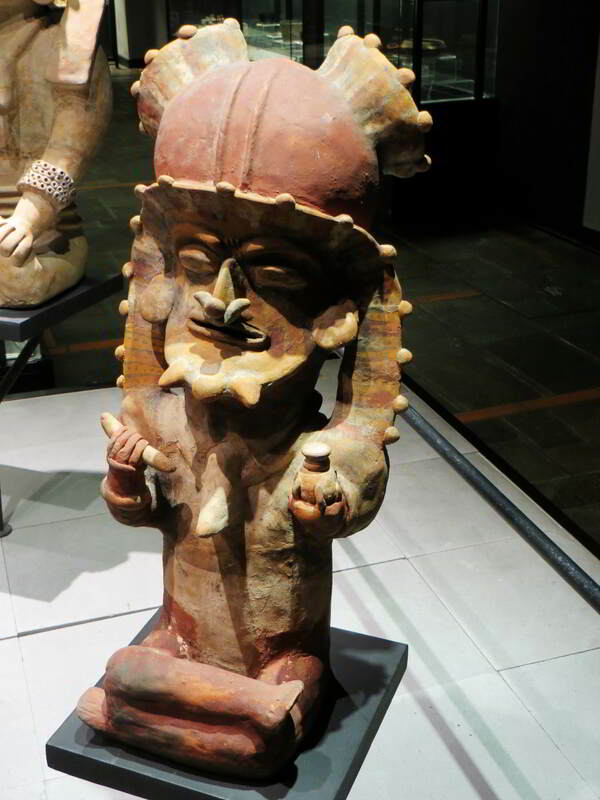 Cultural café, with many living art expression. 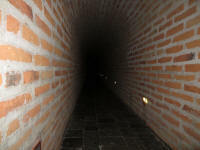 Entry free, consumption expected. 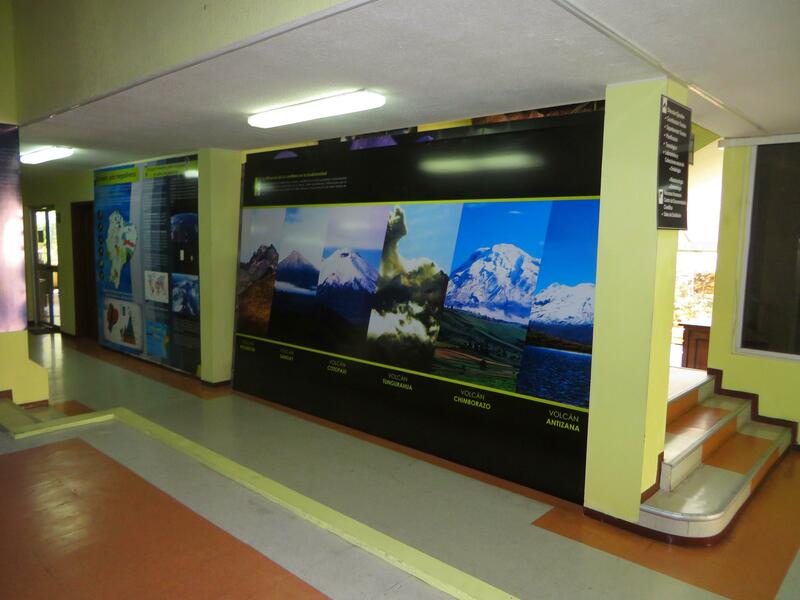 Exposition of historical photographs of the Calle Ronda. Exposition of work of Kingman and other contemporary art. Museum dedicated to Quito's hero Manuela Sáez. Historical mansion with exposition dedicated to María Augusta Urrutia, giving an impression of the lives of the colonial nobility and art of Victor Mideros. Cultural Center and exposition of sculptures. Educational exposition on science particularly related to mapping. 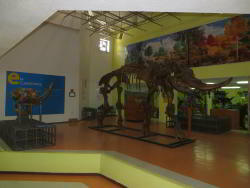 Cultural center Govindas dedicated to conscientious, social and ecological art with emphasis on (Asian) Indian culture. Cultural center in the restored former Santa Clara Market with contemporary art events and expositions with great view over historical center. 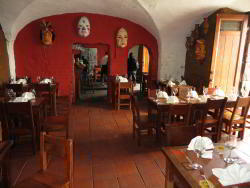 Cultural cafe-restaurant in historical mansion with musical and other cultural expressions. 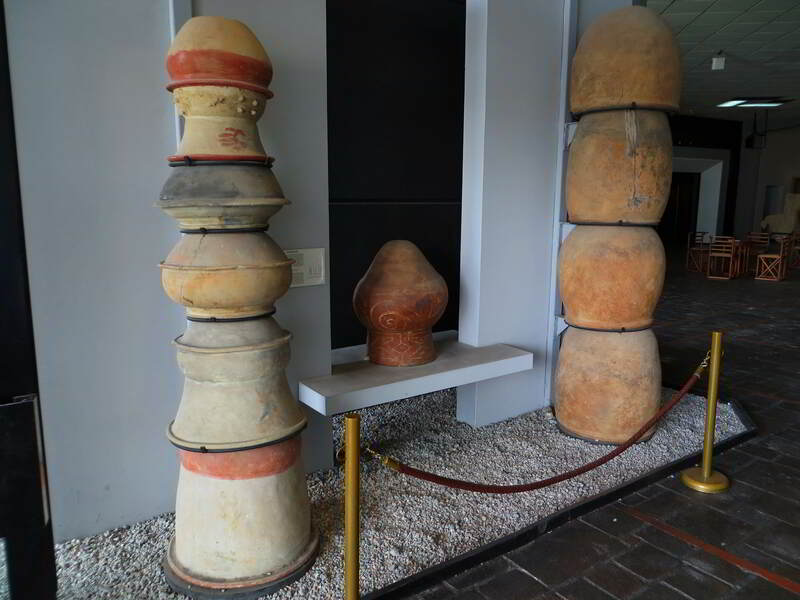 Modern temporary expositions of widely varying themes and library. Cultural enter in the former Military Hospital with expositions of contemporary art, study and documentation center & art laboratory. 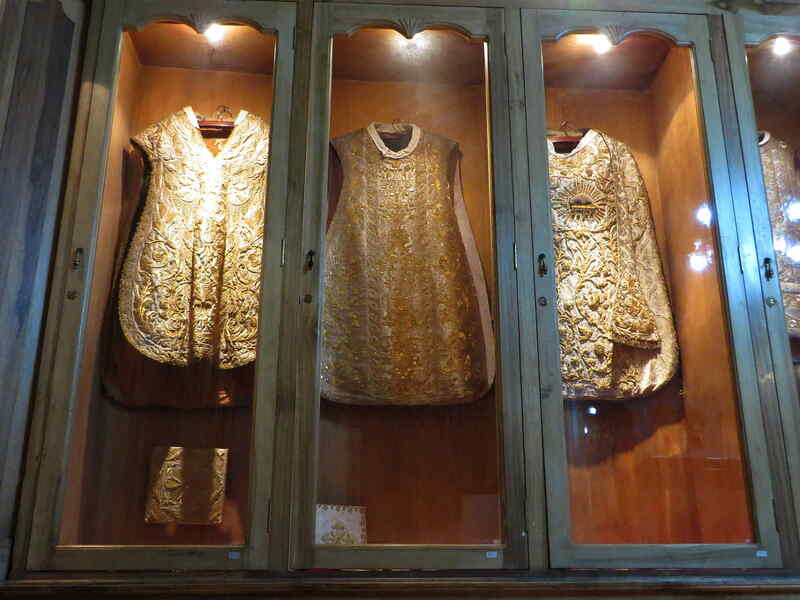 Youth training center for traditional art skills with workshop for architectonical restoration. 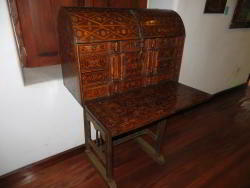 Printing Center dedicated to the study and development of the art of knowledge of printing, offering artists a place for production and marketing of their products. 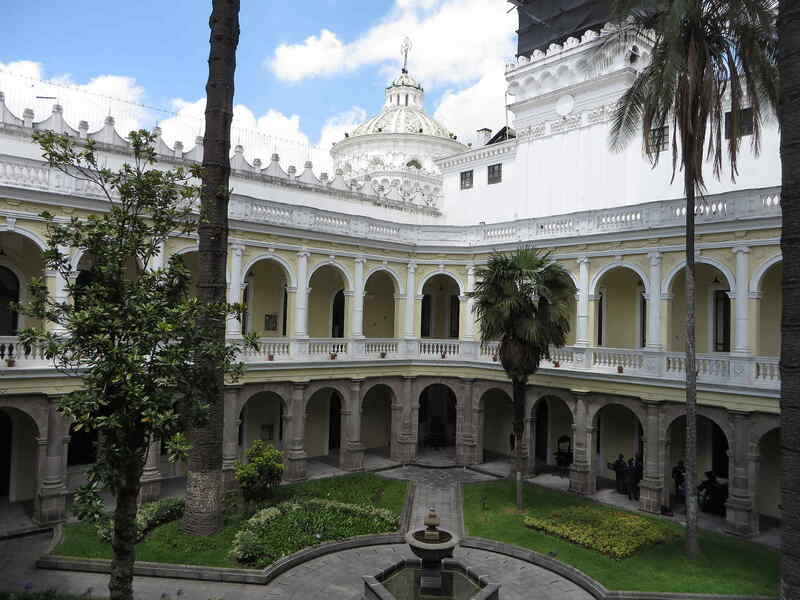 Museum with works of the Quito School of Art of the 16th, 17th and 18th centuries, as well as a library. 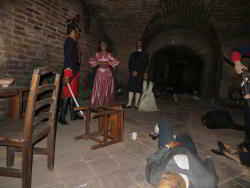 The colonial mansion also serves for cultural center performances. 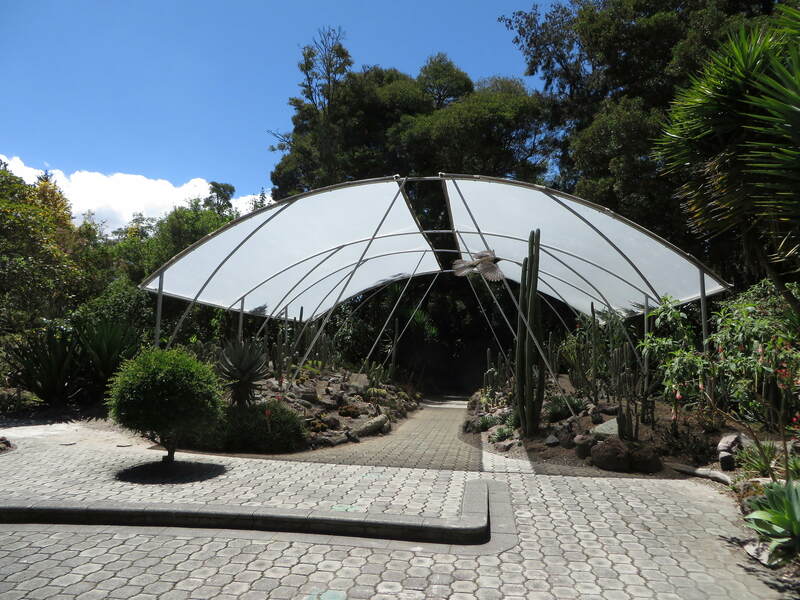 Different ecosystems and thematic gardens. 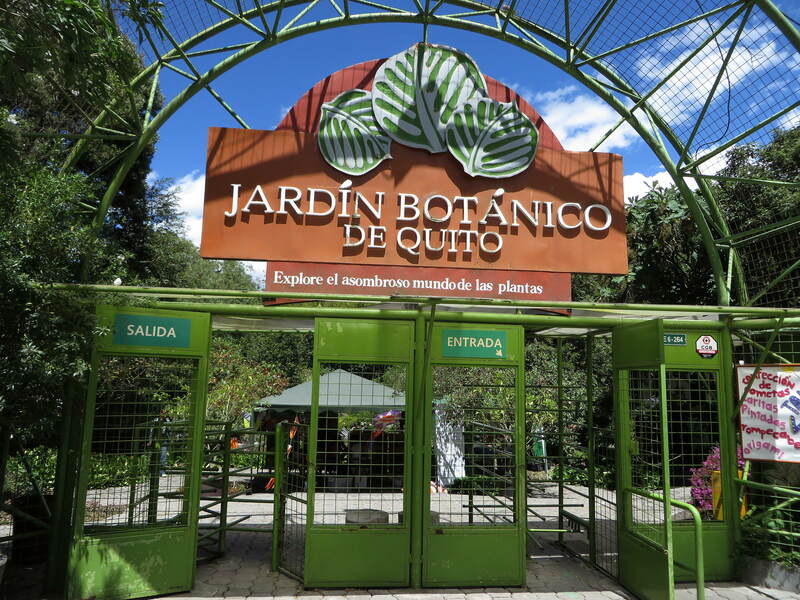 Aviations and Airforce history of Quito with historical aircraft and equipment of Ecuador. 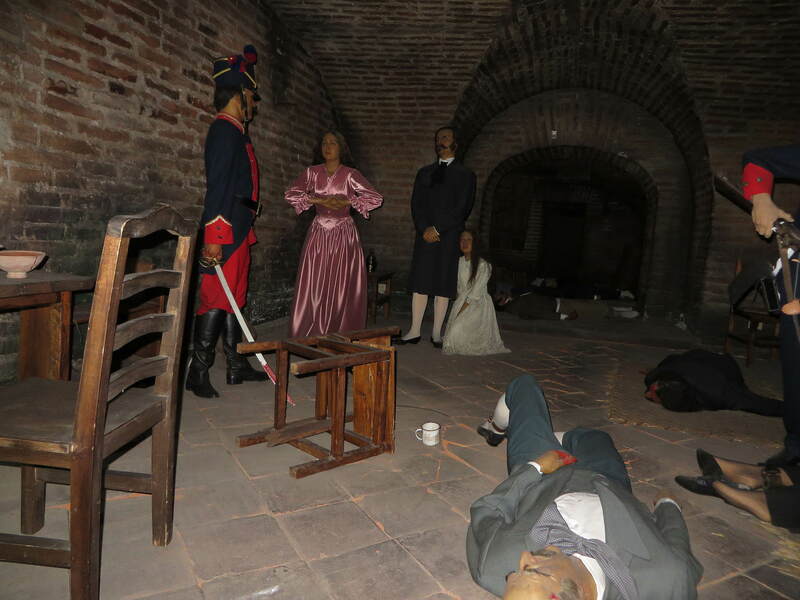 Wax museum with historical moments and figures in the former Quito prison. An interesting historical building with a restored part of the catacomb that traverse the Plaza de la Independencia, connecting churches and palaces. Museum of the seven Ecuadorian Amazon tribes. Oldest archaeological museum of Ecuador with 2 exposition rooms and library with publications. Museum in colonial mansion dedicated to the art works of Camilo Egas. 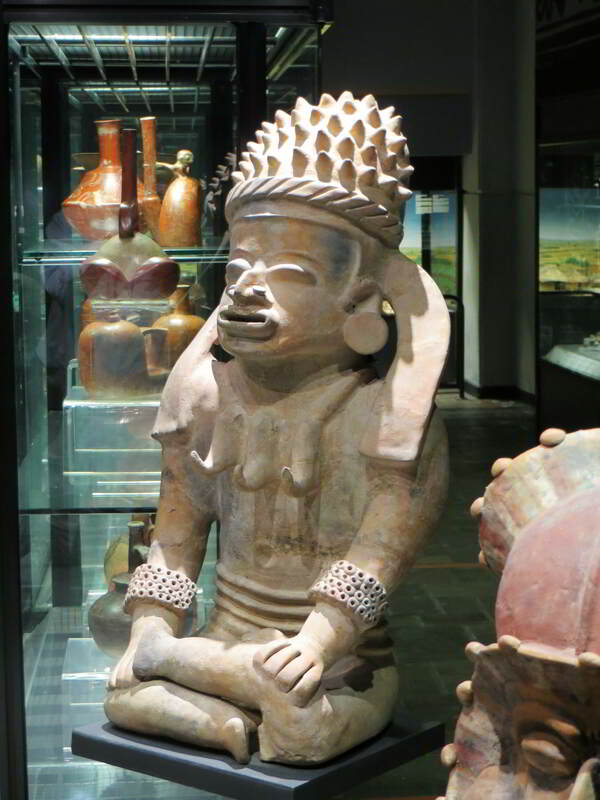 Library, Colonial and historical Art museum. The former hospital with chapel offers scenes and objects of Quito's historical past, including a historical hospital scene. Restaurant and terrace. 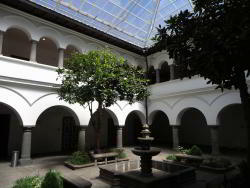 Part of the convent of the Santo Domingo Church converted into museum and courtyard. Open air museum and other expositions of Ecuadorian tribes. 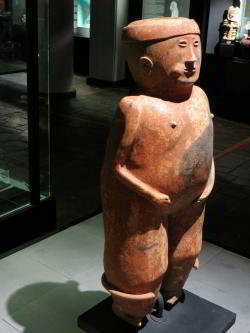 70km North of Quito, archaeological site with water works belonging to the Yumbos culture. 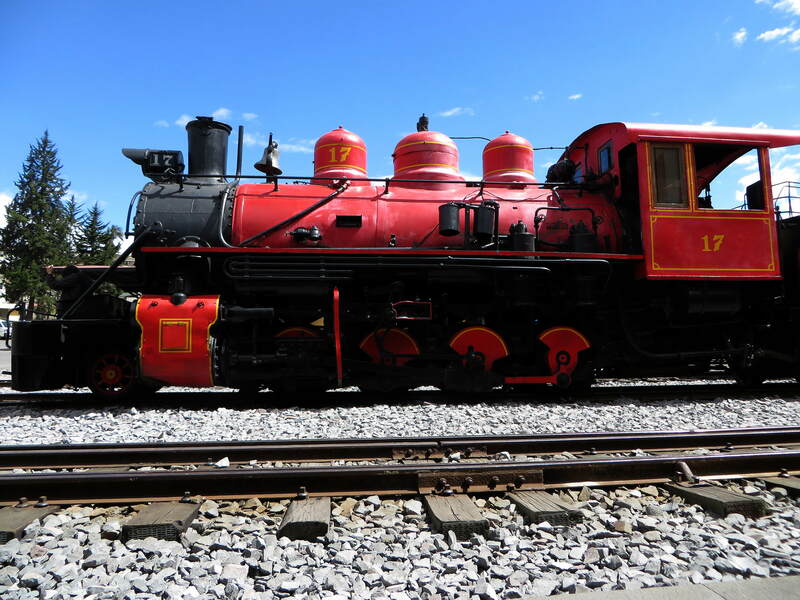 Ecuadorian restored train station is both a museum and the departure point for the famous Quito - Guyaquil railroad renowned for the Devil's nose pass. The restored train service became in operation again in 2014. 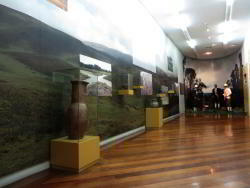 Ethnological museum showcasing the different tribes of Ecuador. 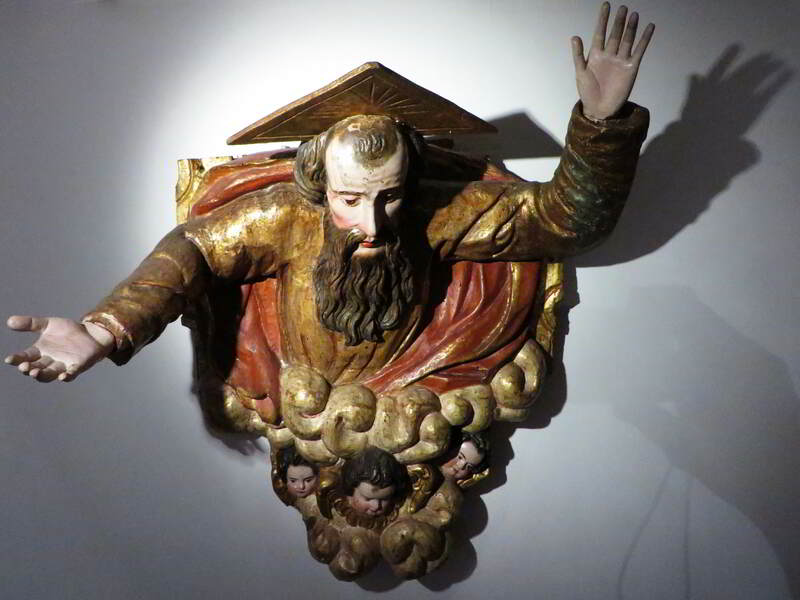 Fransiscaner museum in the San Diego Convent. 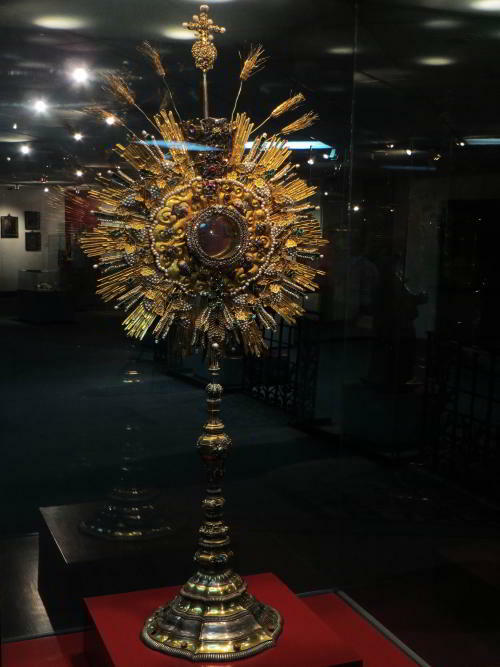 Religious art museum and convent. Splendid balcony view over the San Francisco Church. 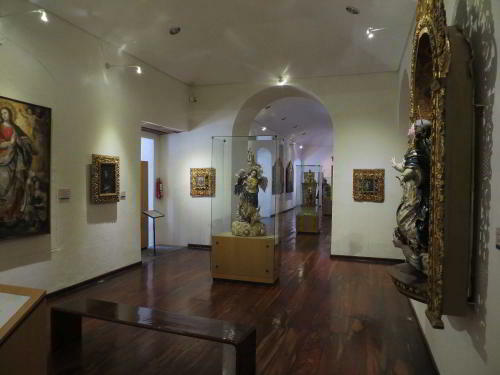 Religious art museum and convent. 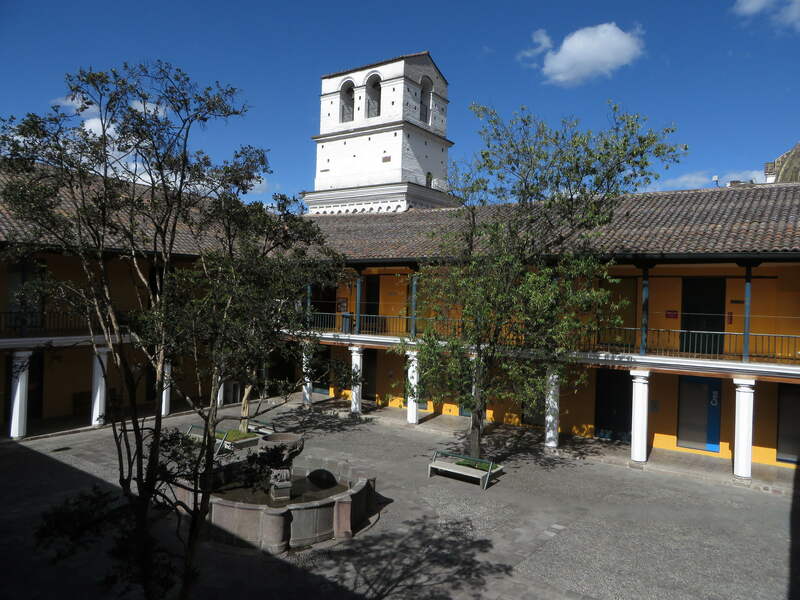 Religious history of the convent with historical scenes. 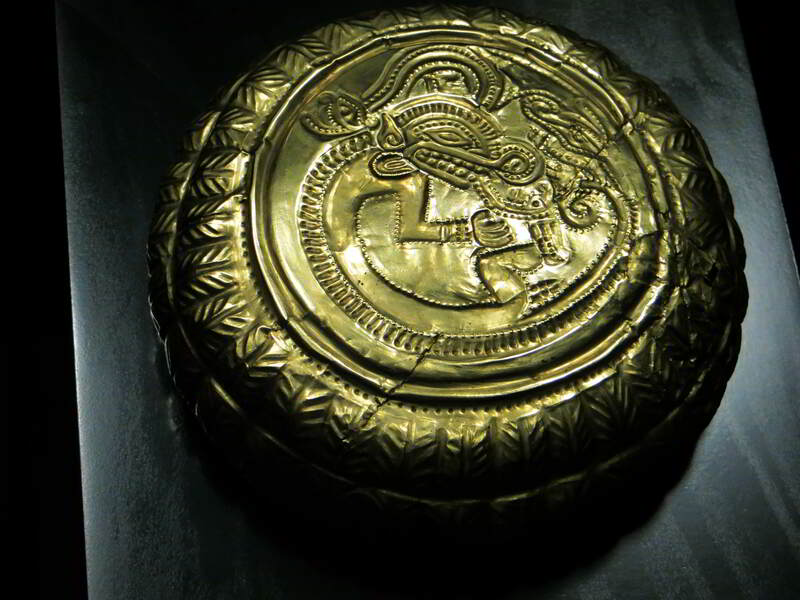 Archaeological and colonial art museum with important gold collection and thematic scenes. 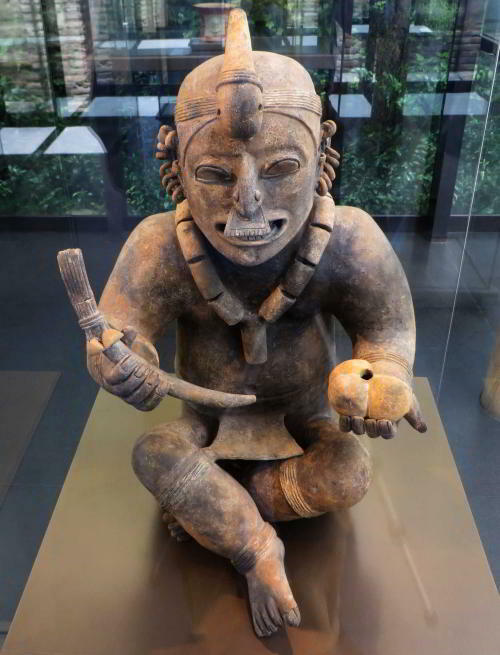 Museo Nacional de Medicina "Eduardo Estrella"
Medical museum with expositions on pre-colonial, colonial and early modern medicine. 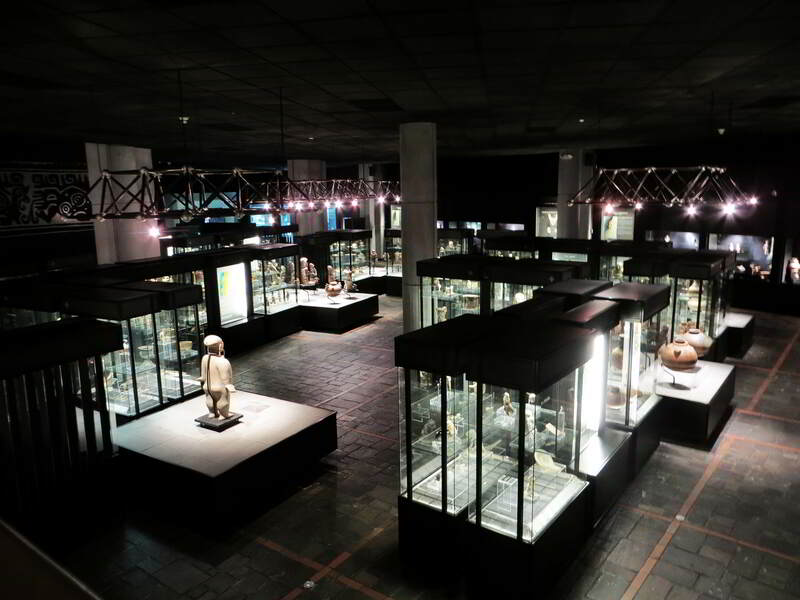 Archaeological museum of the Catholic University, with most artifacts donated by the Weilbauer family. 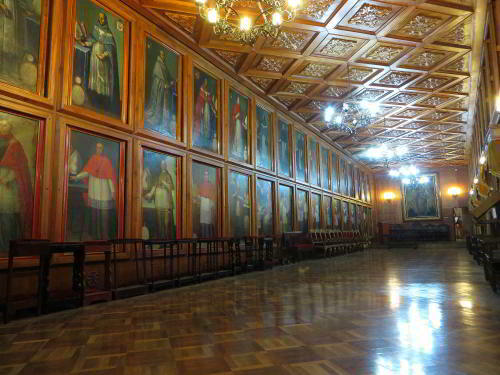 Guided excursions through the Presidential Palace. Passport required for entry. Archaeological site at a colonial hacienda. 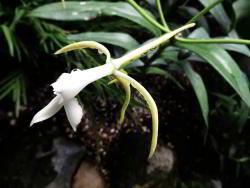 Live collection of amphibians and reptiles. No doubt the best museum in Ecuador, the Museo Nacional has been relocated to the Casa de la Cultura, replacing the former Banco Central Museum. Located in outside of historical Quito, it is famous for its art piece, a golden mask with snake-like figures radiating from its face like sun rays. 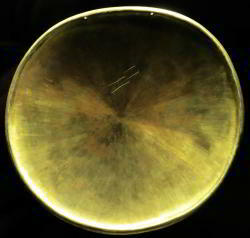 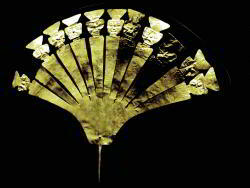 But there are many other great archaeological objects, some of them dating back to 3500 years BC. 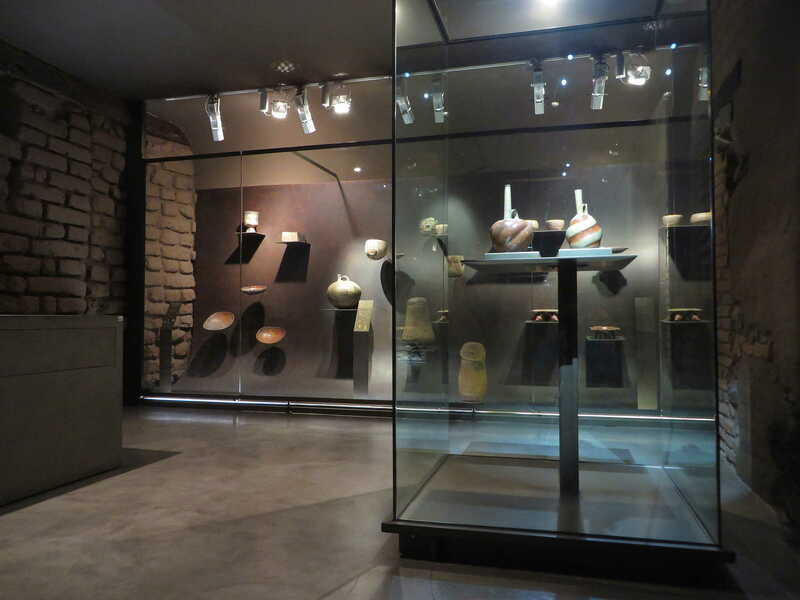 All objects are tastefully displayed in modern glass showcases, artfully distributed in large modern museum rooms. 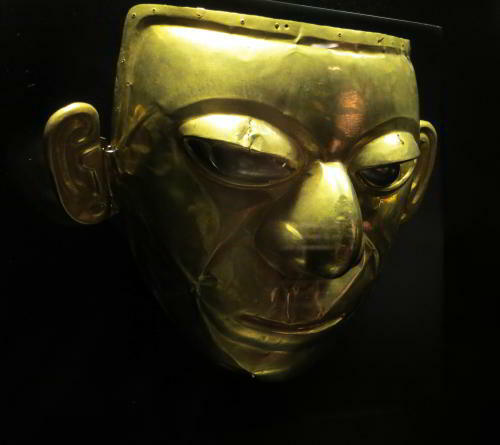 The National Museum is an absolute must to any visitor to Ecuador and entry is totally free. 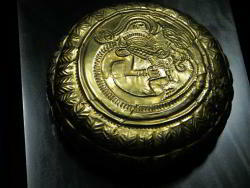 The three main themes are: archaeological pre-Colombian objects, the Gold Room and religious colonial history. 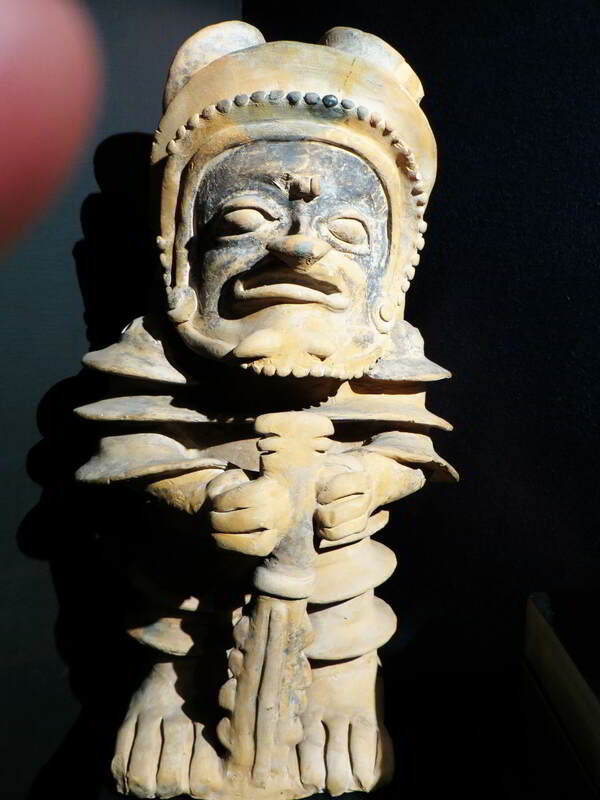 One needs at least an hour to briefly wander through the museum, but I have personally visited it several times, each time discovering some fascinating object I had not noticed before. 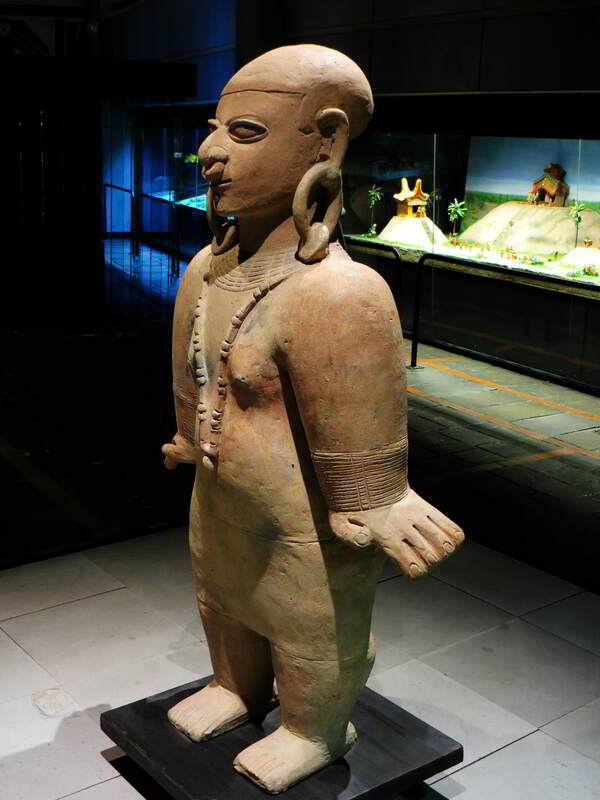 The bilingual explanations are excellent and very modern. 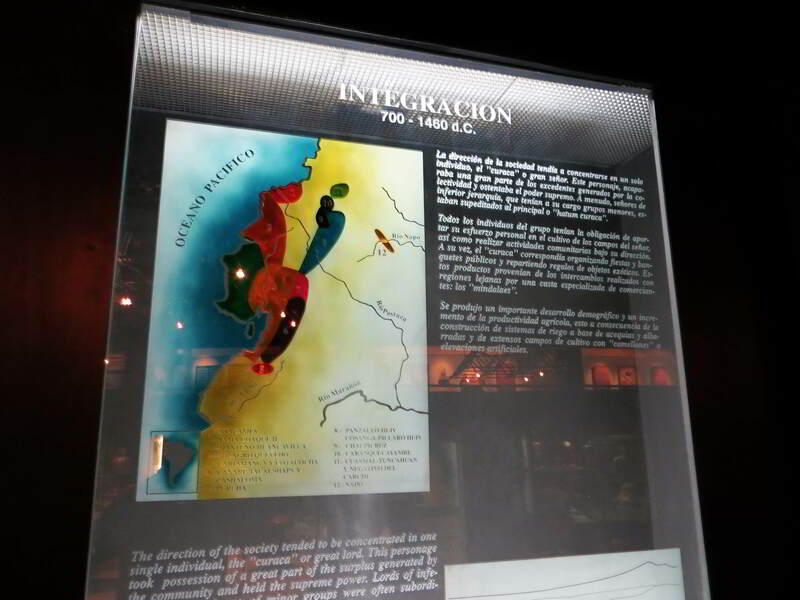 Professionally designed and displayed pre-Colombian history of Ecuador. 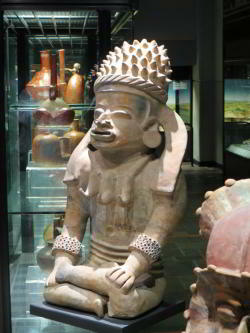 Excellent bi-lingual texts! 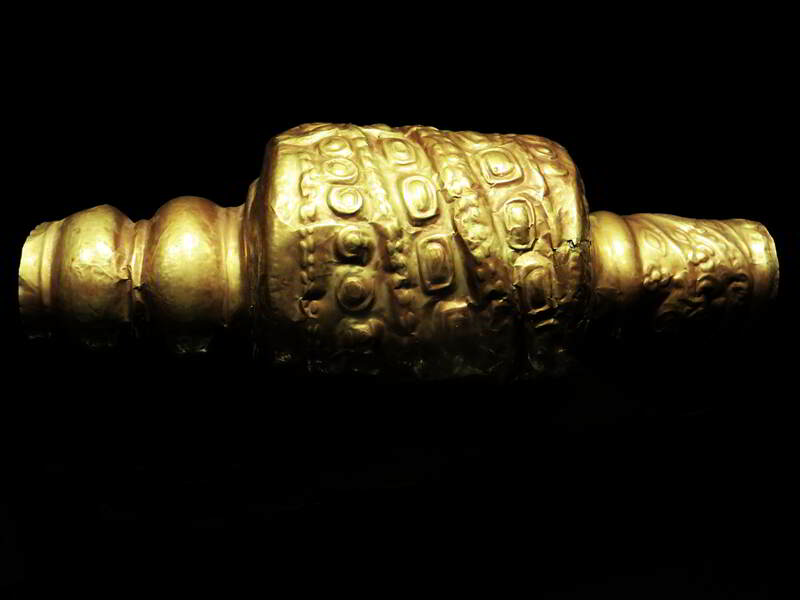 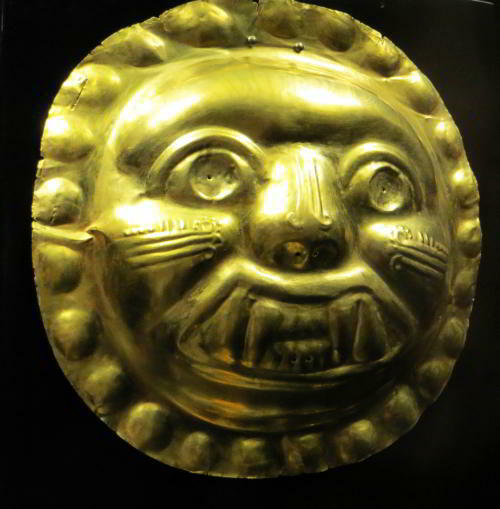 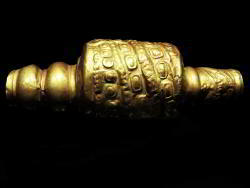 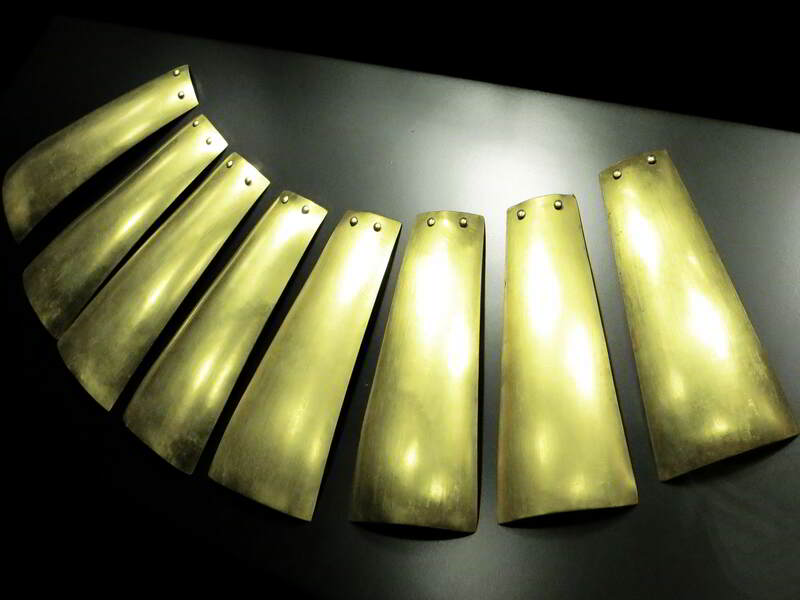 The "gold Room" displays a collection of some of the most fascinating pre-Colombian golden jewellery and artefacts. 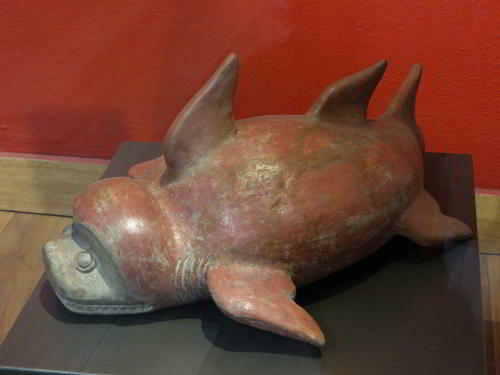 Particularly the coast of Ecuador has been studded with pottery. 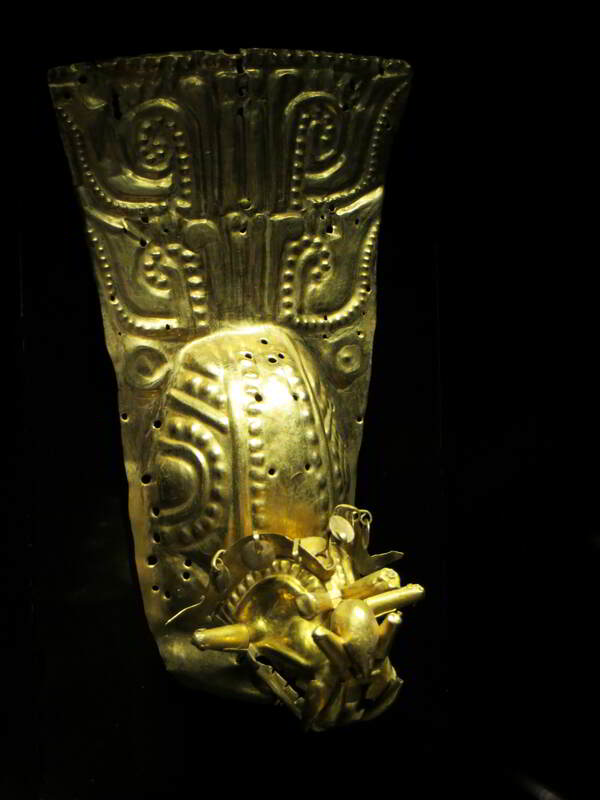 Often layers and layers of smithereens, but wonderful in tact graves have also been found and some beautifully displayed artefacts can be found in the National Museum. Countless artefacts are displayed in the Archaeological Room. 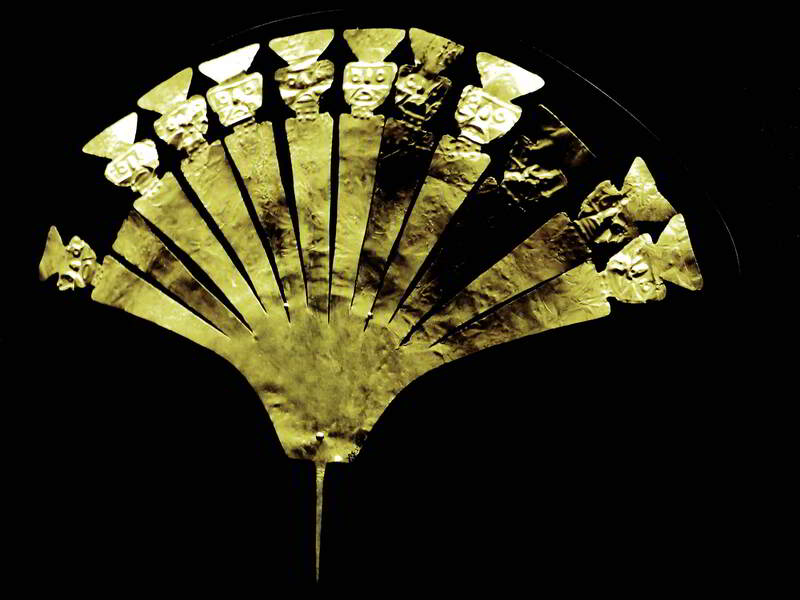 Tastefully displayed in the Gold Room (Sala del Oro), countless golden artefacts are displayed in show cases, grave reconstructions and on replica mannequins. The Colonial Art room show cases beautiful artefacts from churches and well-to-families. 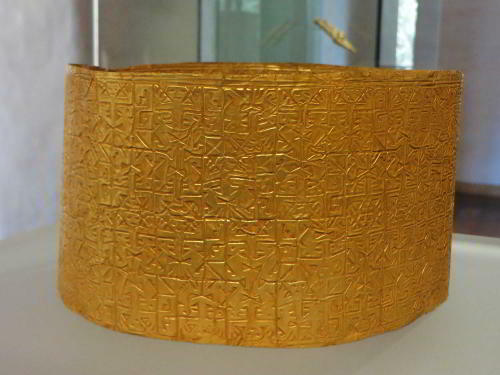 A "custodia" = Sacred receptacle for keeping a symbolic peace of holy bread or wafer. Gold-leaf covered woodcarving of saint. 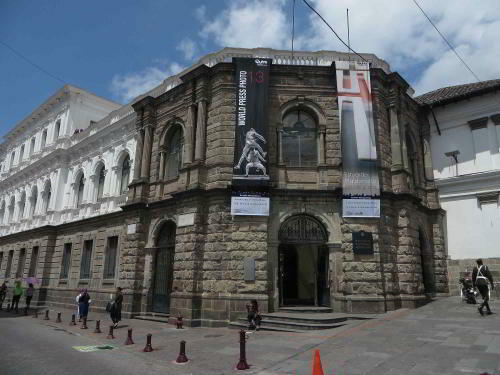 City Museum of Quito (Museo de la Ciudad de Quito) is located in the former Hospital San Juan de Dios. Its modest $3 entry fee is well worth your money. 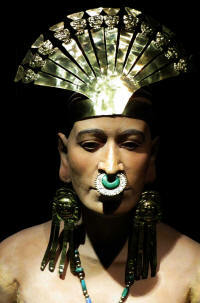 The museum gives a great impression about Quito's early days and its history. 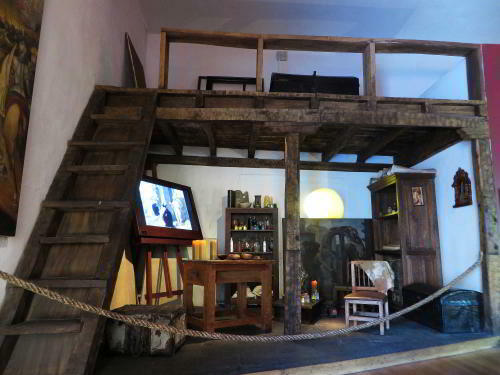 Many colonial scenes are realistically and artfully displayed in the historical building of the hospital. Well worth a visit. 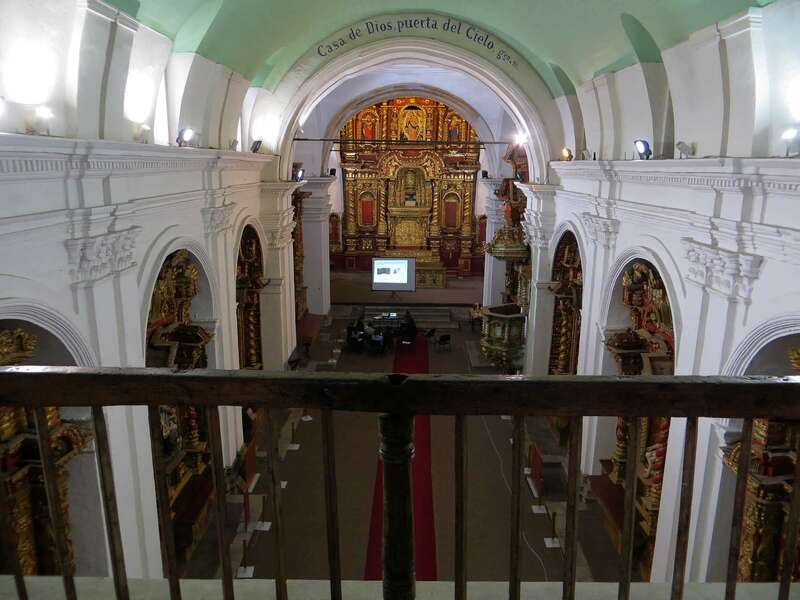 The hospital's beautifully restored chapel is now primarily used for musical and other living arts performances. 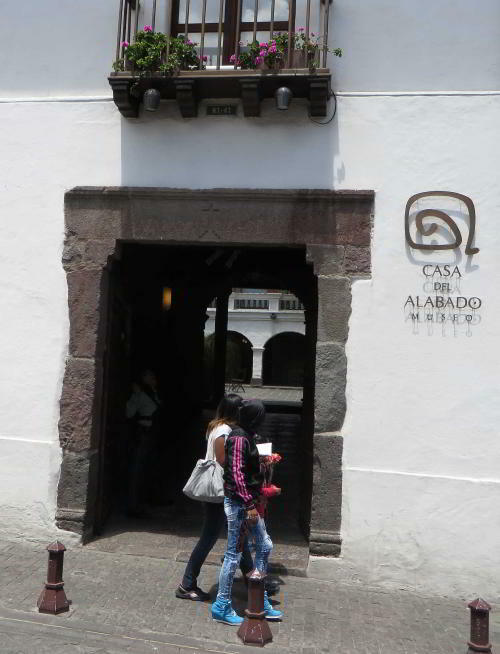 The Casa del Alabado, Museum of Pre-Columbian Art is a museum in a beautiful colonial mansion in old town Quito. 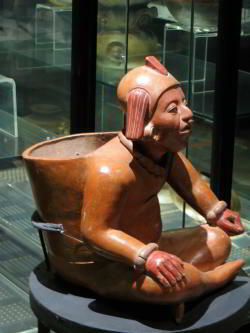 The museum is dedicated to Ecuadorian pre-Columbian art and well worth your visit. 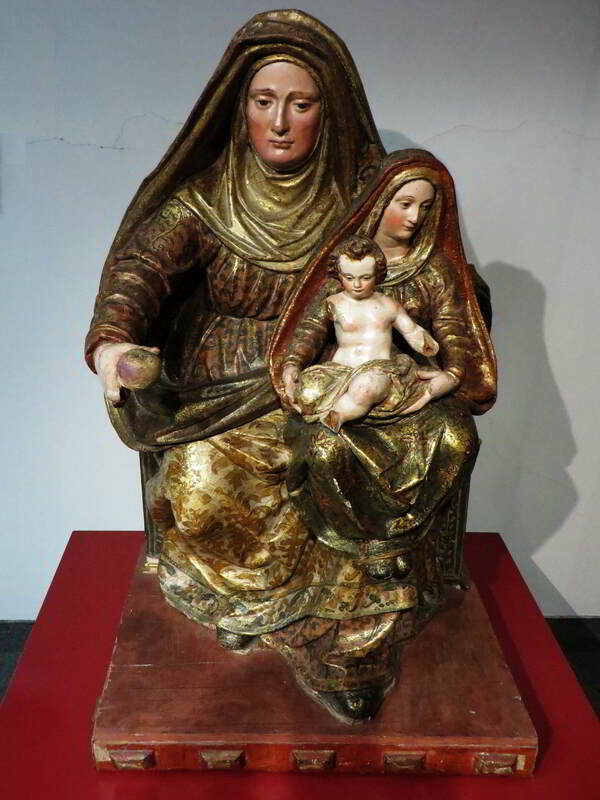 The Carmen Alto Convent has a religious museum with religious paintings and statues. 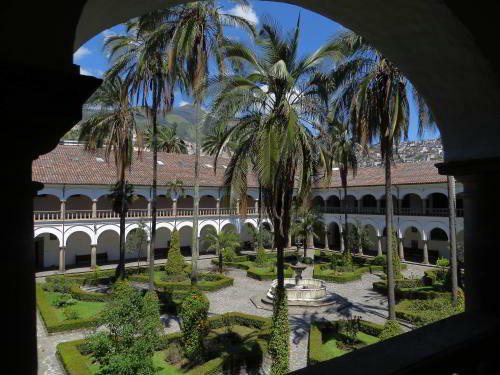 Beautiful court yard of the convent. 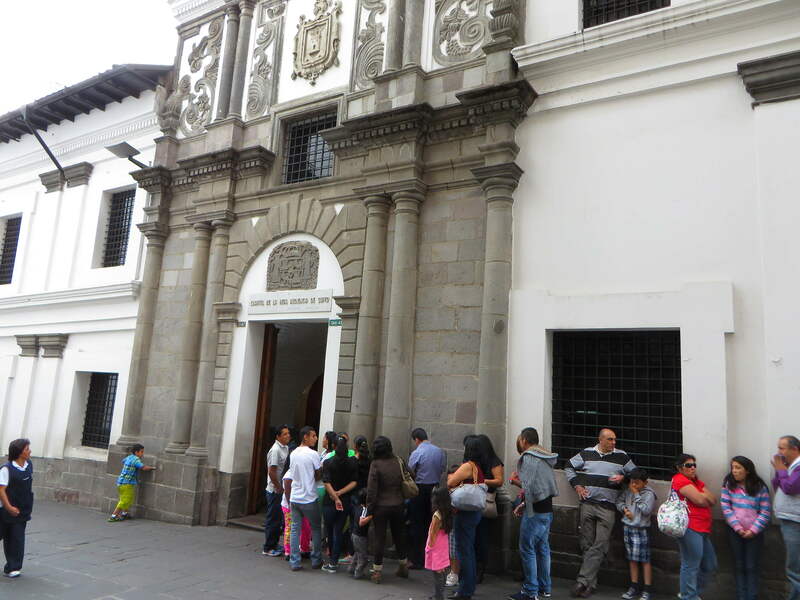 Better designed than the previously listed museum, the San Francisco Convent Museum, to the right of the Church, also houses a collection of religious art pieces and paintings. 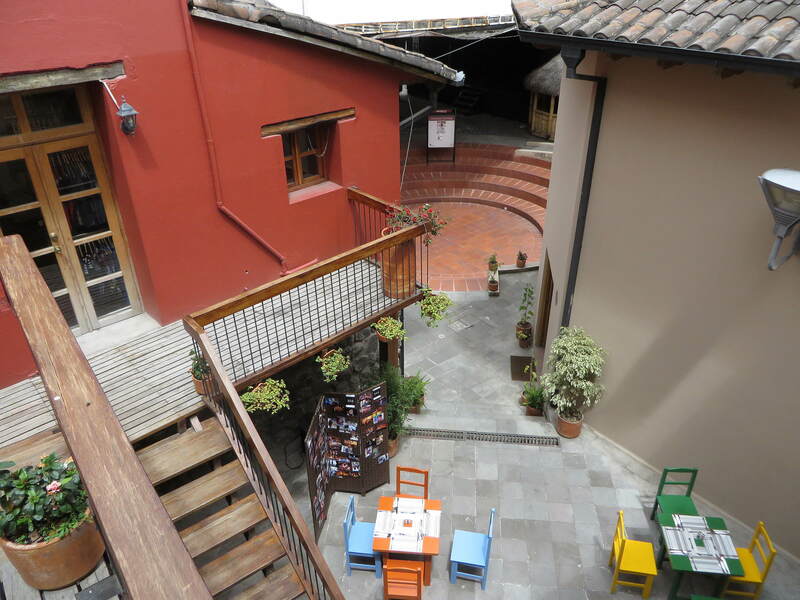 Moreover, it gives a great view over the convent's premises with 2 beautiful patios and a unique view over the church from the otherwise inaccessible balcony. In 1828, the liberator and first president of Ecuador bought this house as his residence, but only lived there briefly until he was assassinated in 1830. 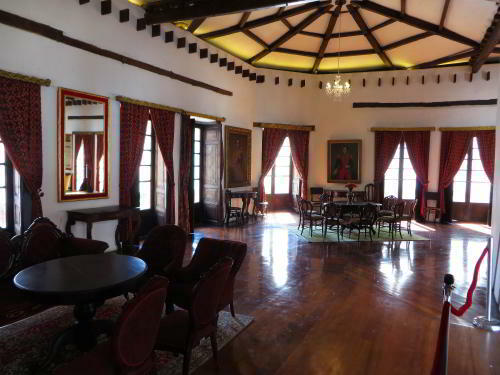 It is a beautiful colonial mansion with a collection of weapons and wonderful furniture of the period. 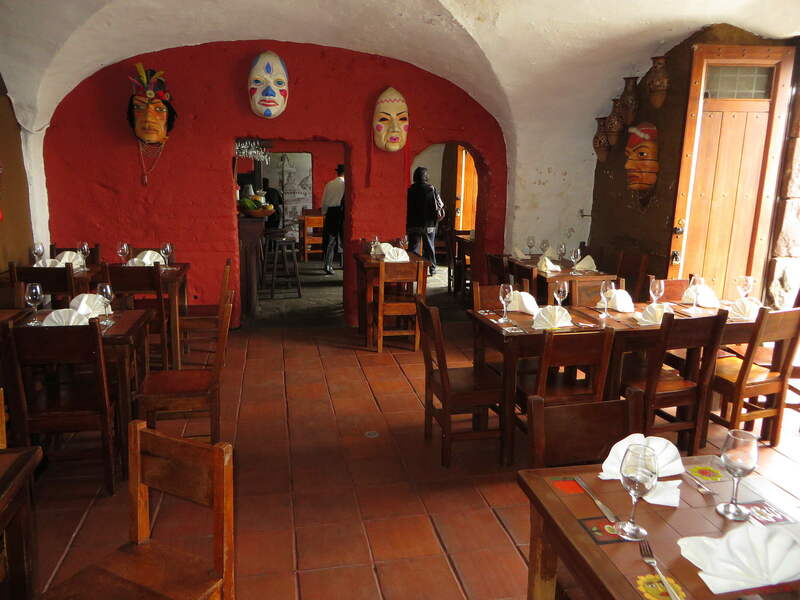 The house gives a splendid impression of how the upper-class and nobles of the day lived in Quito. 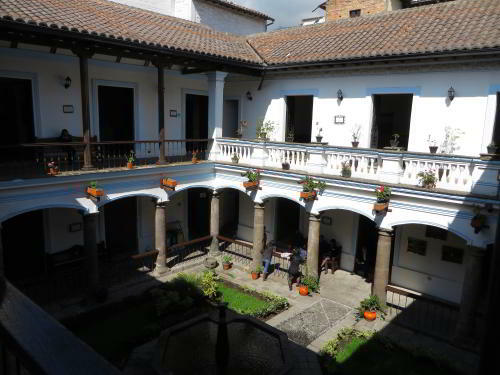 The court yard of the Sucre House. 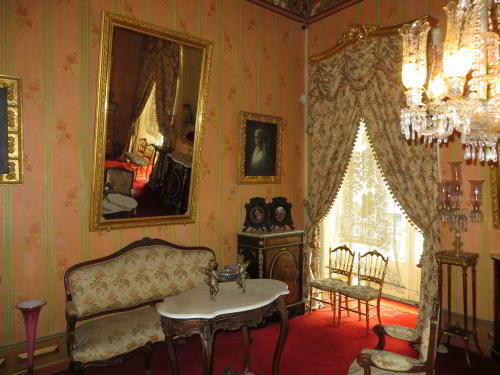 The living room of the Sucre family. 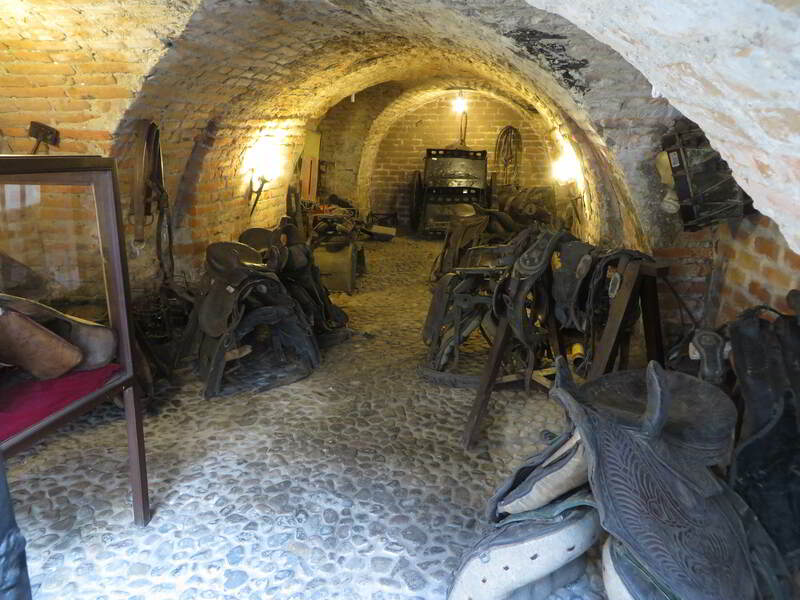 The saddle room of the Sucre House. 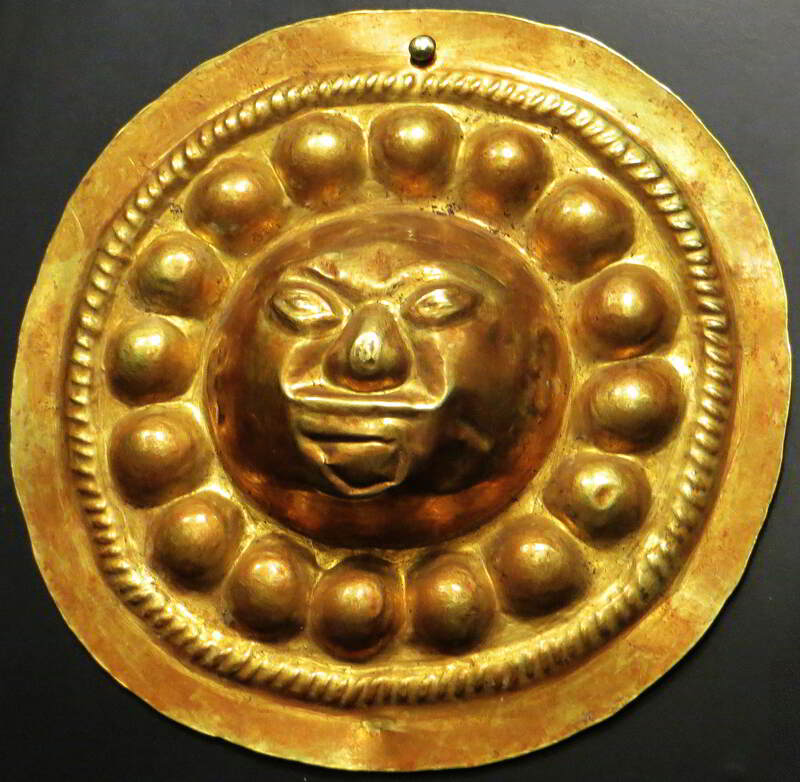 Formerly the home of the national archaeological collection including the famous Golden Sun Mask, the beautiful neoclassical former Banco Central building is now a monetary museum, which still is worth visiting even though it no longer has the prestige of its former archaeological collection, even if if were just for seeing the building interior. This free cultural center of Quito in a neo-classical building across the street from the palace has frequent expositions and is well worth walking in. It has beautiful court yards and a library. 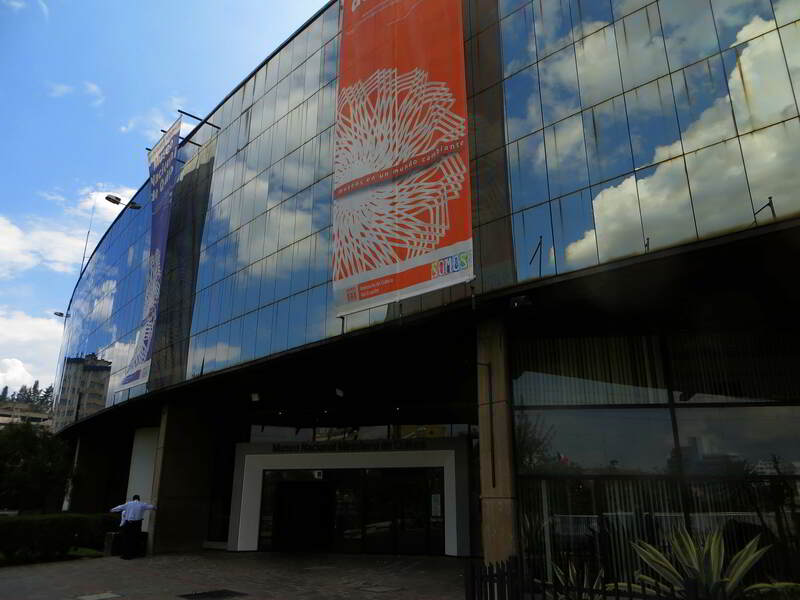 Above left: Centro Cultural Metropolitano entrance. 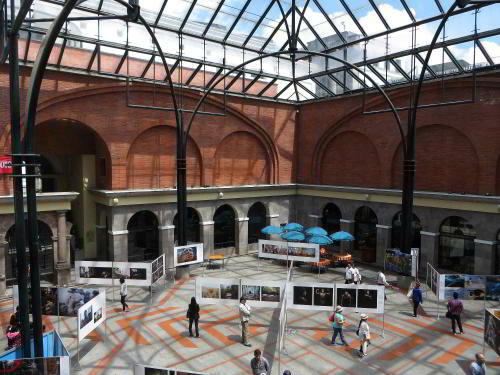 Left: Court yard Centro Cultural Metropolitano. The National Cathedral Museum or Museo Catedral Primada de Quito, is a must as it is the home of the most beautiful room of Quito, the Sala Capitular, which I consider the Versailles Ball Room of Quito and a must see. It further houses a smaller chapel behind the Cathedral, with the Mausoleum of Sucre and a great collection of religious are. 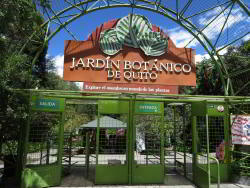 The entrance is little known and located at Calle Venezuela 3-117 & Espejo. The inconspicuous entrance of the National Cathedral Museum. Quito's "Versailles Ball Room", the Sala Capitular, the most beautiful room in Quito and one of the finest museums in Quito. Beautiful robes and miters of the early bishops of Quito are guarded in the treasure room. 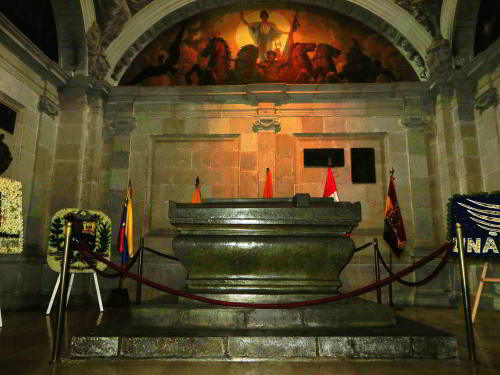 The Admiral Sucre Mausoleum in the Chapel of the National Cathedral Museum. 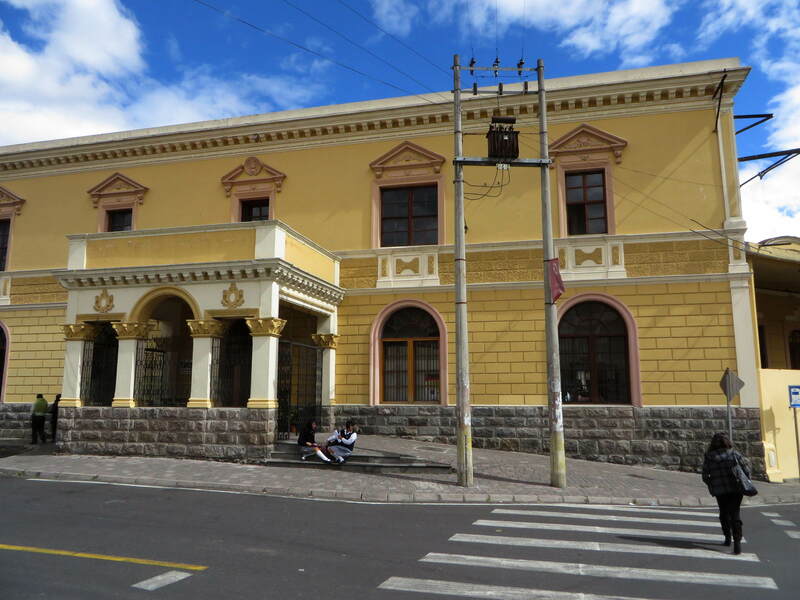 The Chimbacalle Railroad Station used to be the Quito central railroad station during the 19th and 20th century until the railroad system fell became dysfunctional in the 80s. 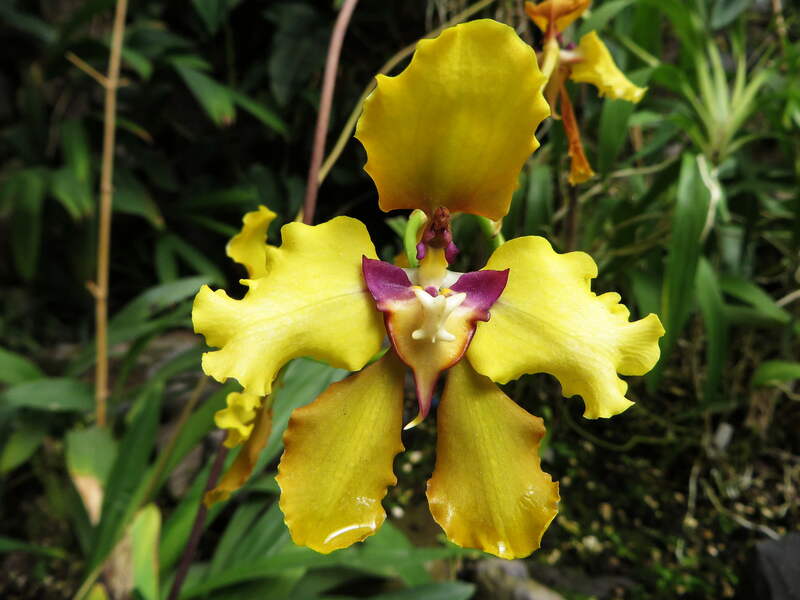 In 2008 the government started restoring the railroad system of Ecuador into its former glory and since 2014, it is possible again to ride the famous train from Quito to Guayaquil, passing through the Devil's Nose Pass. 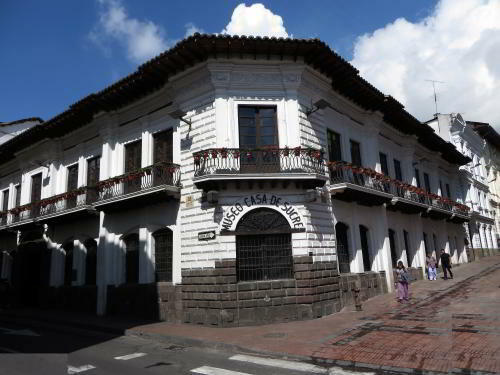 One of the finest colonial mansions, from the street, the María Augusta Urritia House-Museum appears rather inconspicuous. 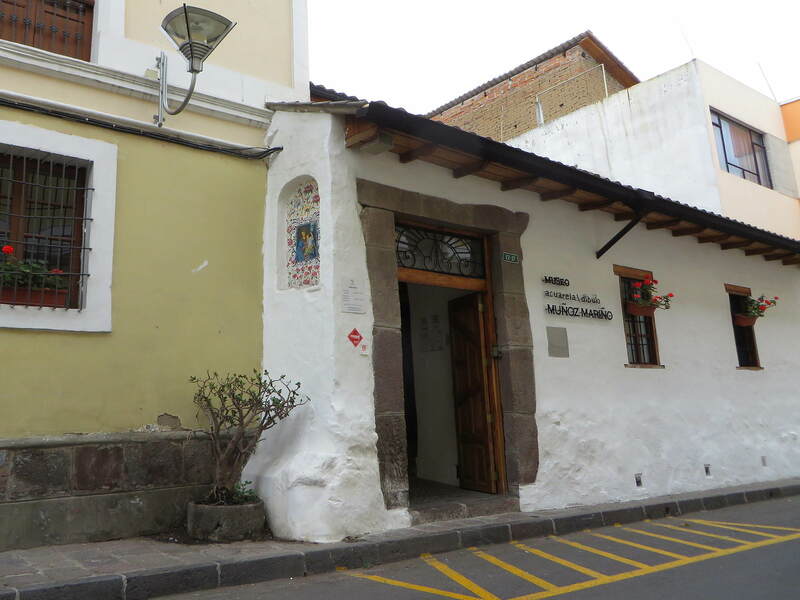 Located on the García Moreno street just past the Jesus Compañía church, this museum is a must to see for a brief walk-in visit to get an impression on how the upper-class lived in the 19th and early 20th centuries. 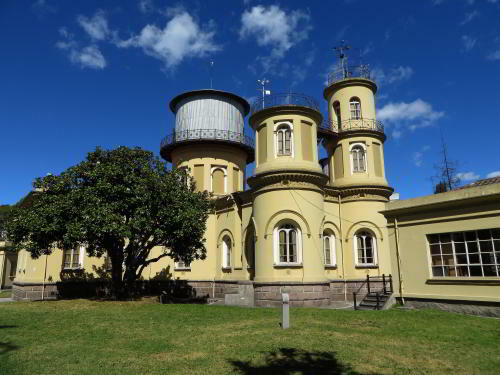 Built in 1873, the Observatory of Quito is the oldest on the continent. Renovated in 2009, it is both a museum of historical instruments and open to the public for star gazing on cloudless nights. 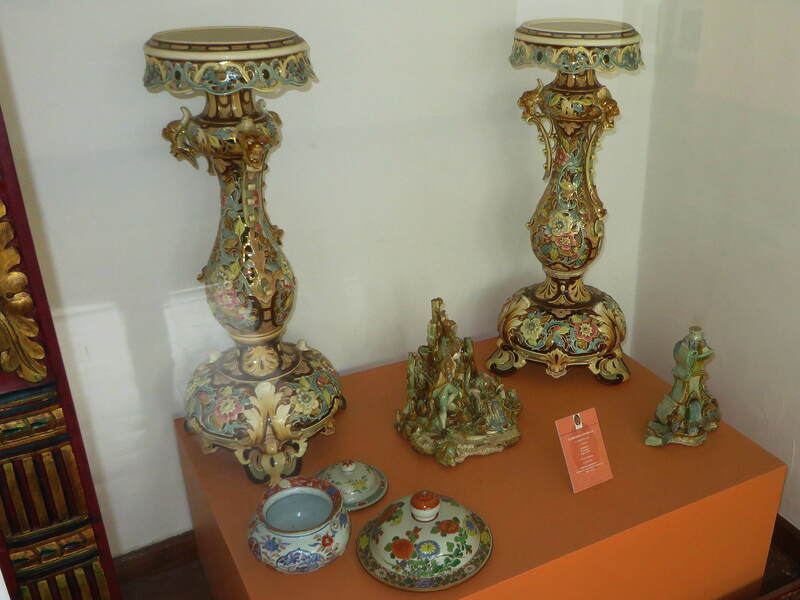 A small museum in a beautiful mansion with colonial art. 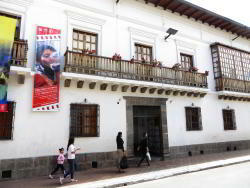 Cultural Center La Casa de Juan Café Sibarí with performing arts. Aquarelle Museum of the work of Muñoz Mariño. 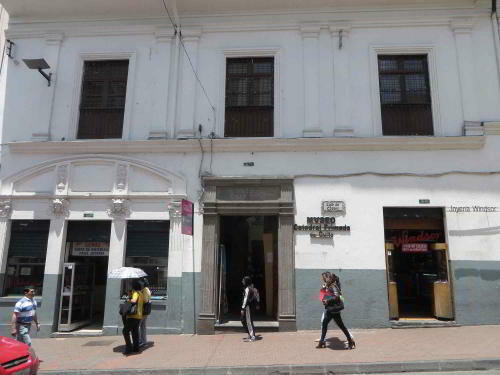 A shop on Plaza San Fransisco, Tianguez has a nice terrace. 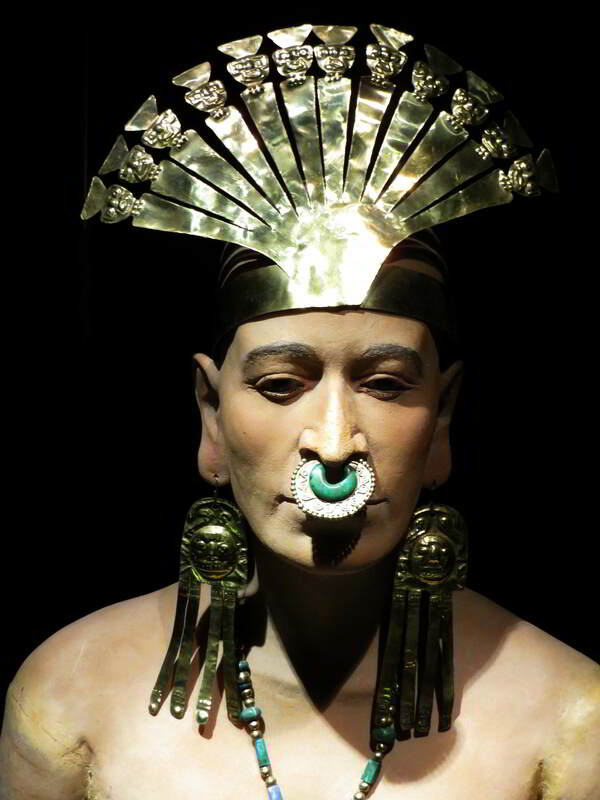 The Wax museum in Quito in the former city jail not only has historical scenes like the French Geodesian mission in wax statues, but also some very interesting catacombs that run under the Plaza Central, connecting palaces and churches.